Ahh. The divinities of snack food. Who's to say that Japan lacks factors of indulgence? No one? Of course not! Although not nearly all of Japan's mouth-watering treats are featured here, let's explore a few of the many that tempt our tastebuds, shall we? 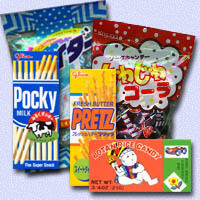 Represented in nearly *10* varieties, Pretz assumes the title of the "Mirror Twin of Pocky". A simple PRETZel stick shimmered with light seasonings, flavorings and whatnot of the nature, Pretz indeed supports it's given title, as the various flavors are more of 'cracker' nature. Honey Butter, Milk Roast, and even Chedder Cheese are just three of the delicious variations; Dai-chan's favorite are easilly the Chedder Cheese! Although only one remotely "dessert" flavor exists [Yaki (Wheat) Chocolate], Pretz still proves to be one of the top choices of snackfood! Surely a known product, Yan Yan ordains a fun snack with delicious creme. Delicately toasted biscuit sticks neatly packed with a dispenser holding one or two of four creme frosting flavors, Yan Yan truly reserves the title of 'dessert on the go'. Coming in varities such as Chocolate, Strawberry, Vanilla and Double Creme [Chocolate and Strawberry / Chocolate and Vanilla], Yan Yan is surely a treat not to be missed. As it's name-sake, HiChew is ... well, a candy chew! Rectangle pieces conceal mouth-watering fruit-flavors such as Apple, Strawberry and Grape. This particular snack/candy can easilly be compared to the likes of Starburst Fruit Chews, however, without so much sweetness, providing a nice fruit-flavored candy without too much "candy" flavor! Another "fruit chew", Kasugai Gummies [ as Steve would put it ] 'Rock the World'! A *wide* variety of these yummy gummy-pieces prove quite popular with Otaku and those alike, complimenting a startling *10* different fruits. Mixed-pack arrangements are also availble for those Jack-of-all-Trade snackfood lovers out there. Individually wrapped, a simple tear of the seal easilly governs to an empty bag of these delightful, light and very enjoyable candies. Another personal favorite, as all of the previous. For you SailorMoon lovers out there, this particular snackfood may look quite familiar -- Remember "Seiya to Usagi no DokiDoki date"? The very soda chugged by our kawaii-couple in this episode was indeed the old-style Japanese soda, Ramune! Ramune seems hard to find in certain areas, but it's surely something everyone must try. Almost the Japanese-counterpart of Slice and 7-Up, Ramune provides a sweet, yet subtle taste in both soda and candy-form. The candy version is represented in tablet structure, reading for munching! Calbee seems to be the ruler of all chip products! Mainly spanning the "potato chip" factor, Calbee produces delicious varieties, as well as some sea-food snippets. Calbee's light, crispy products prove satisfying; flavors such as the original 'Potato', 'Pizza Potato', 'Sweet Potato' and even 'Steak Potato' tickle the tastebuds with overwhelmingly surprising seasonings and flavors.